The unusual flavours in this recipe are perfectly balanced, making it a delicious dessert to follow a rich main course. Using an ice cream machine gives the best results but if you don't have one, see our Cook's Tip, below. Put the sugar in a saucepan with the chillies and 225ml water, then heat gently until the sugar dissolves. Pour into a bowl and leave to cool completely. Stir in the lemon juice and olive oil and churn in an ice cream machine according to the instructions. Once the mixture is slushy, pour in the egg white and continue to churn until smooth and thick enough to scoop. 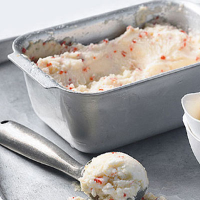 Turn into a freezer-proof container and freeze until ready to use. Serve in small portions, scooped into glasses or small bowls. The sorbet will set firm in the freezer if made more than a day in advance. To soften it slightly before serving, transfer to the fridge for about 45 minutes. If you don't have an ice cream machine, stir in the lemon juice and olive oil in step 2, beat with an electric whisk, then freeze for 1-2 hours, until slushy. Whisk again, then whisk in the egg whites. Freeze for a further 1½-2 hours, or until firm. This recipe contains raw egg.